If any people ever fought for liberty and justice, it was the Cheyennes. If any ever demonstrated their phys­ical and moral courage beyond cavil, it was this race of purely American heroes, among whom Little Wolf was a leader. I was told of another kind act of his under trying circumstances. While still a youth, he was caught out with a party of buffalo hunters in a blinding blizzard. They were compelled to lie down side by side in the snowdrifts, and it was a day and a night before they could get out. The weather turned very cold, and when the men arose they were in danger of freezing. Little Wolf pressed his fine buf­falo robe upon an old man who was shak­ing with a chill and himself took the other's thin blanket. As a full-grown young man, he was attracted by a maiden of his tribe, and according to the custom then in vogue the pair disappeared. When they re­turned to the camp as man and wife, behold! there was great excitement over the affair. It seemed that a certain chief had given many presents and paid un­mistakable court to the maid with the in­tention of marrying her, and her parents had accepted the presents, which meant consent so far as they were concerned. But the girl herself had not given consent. The resentment of the disappointed suitor was great. It was reported in the village that he had openly declared that the young man who defied and insulted him must expect to be punished. As soon as Little Wolf heard of the threats, he told his father and friends that he had done only what it is every man's privilege to do. "Tell the chief," said he, "to come out with any weapon he pleases, and I will meet him within the circle of lodges. He shall either do this or eat his words. The woman is not his. Her people ac­cepted his gifts against her wishes. Her heart is mine." The chief apologized, and thus avoided the inevitable duel, which would have been a fight to the death. 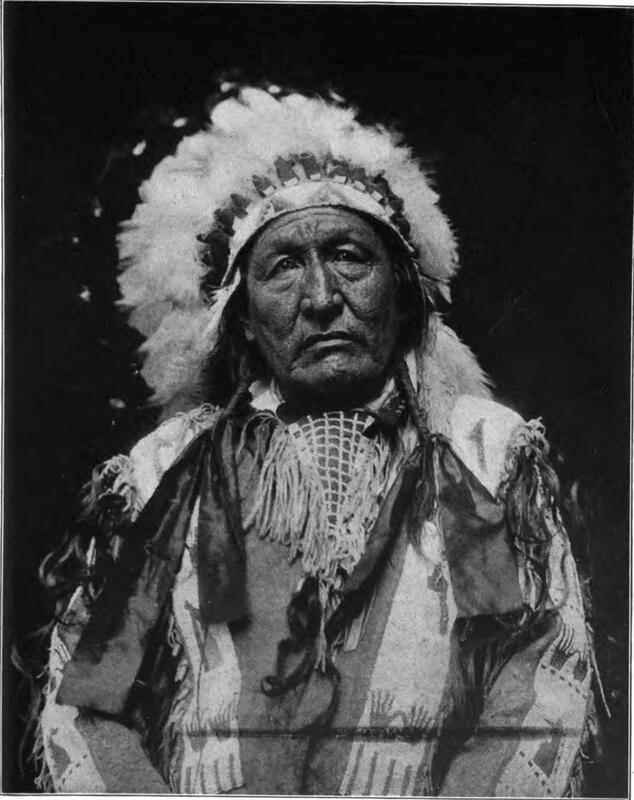 The early life of Little Wolf offered many examples of the dashing bravery characteristic of the Cheyennes, and in­spired the younger men to win laurels for themselves. He was still a young man, perhaps thirty-five, when the most trying crisis in the history of his people came upon them. As I know and as Doctor Grinnell's book amply corrobo­rates, he was the general who largely guided and defended them in that tragic flight from the Indian Territory to their north­ern home. I will not discuss the justice of their cause: I prefer to quote Doctor Grinnell, lest it appear that I am in any way exaggerating the facts. "The Indians endured this for about a year, and then their patience gave out. They left the agency to which they had been sent and started north. Though troops were camped close to them, they attempted no concealment of their pur­pose. Instead, they openly announced that they intended to return to their own country. "We have heard much in past years of the march of the Nez Perces under Chief Joseph, but little is remembered of the Dull Knife outbreak and the march to the north led by Little Wolf. The story of the journey has not been told, but in the traditions of the old army this campaign was notable, and old men who were sta­tioned on the plains forty years ago are apt to tell you, if you ask them, that there never was such another journey since the Greeks marched to the sea. . . .
"The fugitives pressed constantly north­ward undaunted, while orders were flying over the wires, and special trains were carrying men and horses to cut them off at all probable points on the different railway lines they must cross. Of the three hundred Indians, sixty or seventy were fighting men — the rest old men, women, and children. An army officer once told me that thirteen thousand troops were hurrying over the country to capture or kill these few poor people who had left the fever-stricken South, and in the face of every obstacle were steadily marching northward. "The War Department set all its re­sources in operation against them, yet they kept on. If troops attacked them, they stopped and fought until they had driven off the soldiers, and then started north again. Sometimes they did not even stop, but marched along, fighting as they marched. For the most part they tried — and with success — to avoid conflicts, and had but four real hard fights, in which they lost half a dozen men killed and about as many wounded." It must not be overlooked that the ap­peal to justice had first been tried before taking this desperate step. Little Wolf had gone to the agent about the middle of the summer and said to him: "This is not a good country for us, and we wish to re­turn to our home in the mountains where we were always well. If you have not the power to give permission, let some of us go to Washington and tell them there how it is, or do you write to Washington and get permission for us to go back." "Stay one more year," replied the agent, "and then we will see what we can do for you." "No," said Little Wolf. "Before another year there will be none left to travel north. We must go now." Soon after this it was found that three of the Indians had disappeared and the chief was ordered to surrender ten men as hostages for their return. He refused. "Three men," said he, "who are traveling over wild country can hide so that they cannot be found. You would never get back these three, and you would keep my men prisoners always." The agent then threatened if the ten men were not given up to withhold their rations and starve the entire tribe into sub­mission. He forgot that he was address­ing a Cheyenne. These people had not understood that they were prisoners when they agreed to friendly relations with the government and came upon the reservation. Little Wolf stood up and shook hands with all present before making his final deliberate address. "Listen, my friends, I am a friend of the white people and have been so for a long time. I do not want to see blood spilt about this agency. I am going north to my own country. If you are going to send your soldiers after me, I wish you would let us get a little distance away. Then if you want to fight, I will fight you, and we can make the ground bloody at that place." The Cheyenne was not bluffing. He said just what he meant, and I presume the agent took the hint, for although the military were there they did not under­take to prevent the Indians' departure. Next morning the teepees were pulled down early and quickly. Toward evening of the second day, the scouts signaled the approach of troops. Little Wolf called his men together and advised them under no circumstances to fire until fired upon. An Arapahoe scout was sent to them with a message. "If you surrender now, you will get your rations and be well treated." After what they had endured, it was im­possible not to hear such a promise with contempt. Said Little Wolf: "We are going back to our own country. We do not want to fight." He was riding still nearer when the soldiers fired, and at a signal the Cheyennes made a charge. They succeeded in holding off the troops for two days, with only five men wounded and none killed, and when the military re­treated the Indians continued northward carrying their wounded. This sort of thing was repeated again and again. Meanwhile Little Wolf held his men under perfect control. There were practically no depredations. They secured some boxes of ammunition left behind by retreating troops, and at one point the young men were eager to follow and de­stroy an entire command who were apparently at their mercy, but their leader withheld them. They had now reached the buffalo country, and he always kept his main object in sight. He was extraor­dinarily calm. Doctor Grinnell was told by one of his men years afterward: "Little Wolf did not seem like a human being. He seemed like a bear." It is true that a man of his type in a crisis becomes spiritually transformed and moves as one in a dream. At the Running Water the band di­vided, Dull Knife going toward Red Cloud agency. He was near Fort Robinson when he surrendered and met his sad fate. Little Wolf remained all winter in the Sand Hills, where there was plenty of game and no white men. Later he went to Montana and then to Pine Ridge, where he and his people remained in peace until they were removed to Lame Deer, Mon­tana, and there he spent the remainder of his days. There is a clear sky beyond the clouds of racial prejudice, and in that final Court of Honor a noble soul like that of Little Wolf has a place.